The big deal for me this past weekend was the birth of my first grandchild – a grandson. People are already asking me about what his first technology will be. I think I’ll leave that to his parents. At least for now. Earlier in the week though I did collect a few things to share. First off, in case you missed them, I’ve blogged about several contests/competitions/awards for students lately. Check them out and see if any are appropriate for your students. iPads and Pens in the classroom by Garth Flint. It sure does seem like a lot of technology is thrown into schools without proper planning and teacher preparation. This is the largest collection of FREE Microsoft eBooks I have ever seen. Your IT support people may be very interested. CS EdCamp Anyone? is my latest guest post at the CSTA blog. What do you think of a computer science unconference somewhere and sometime? Inspiring Quotes from 10 Influential Women in Tech something for a bulletin board perhaps? 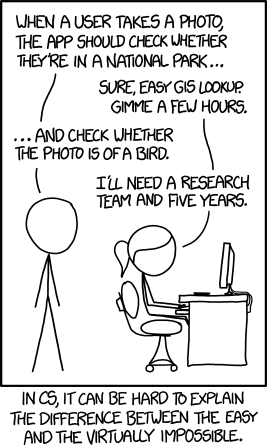 I love this carton from xkcd. A lot of people, basically people without experience with computer science, don’t understand the difference between what is easy and what is hard in software.